Most people are used to a comfortable sorting option, like, e.g. in the Windows Explorer: Clicking the table header of a column will sort the files in in ascending or descending order, this being indicated by an arrowhead pointing upwards or downwards shown in the table header. Wouldn't it be nice if you could use this functionality also in XGantt? In my blog post I'm going to show you how this is done in three easy steps and with little programming effort. This little arrowheads can easily be added to your Gantt chart - just follow the three steps described below. You need two graphic files for displaying the arrowheads, hereinafter referred to as arrow-down.png and arrow-up.png, which have to be added as resources to your Visual Studio solution. 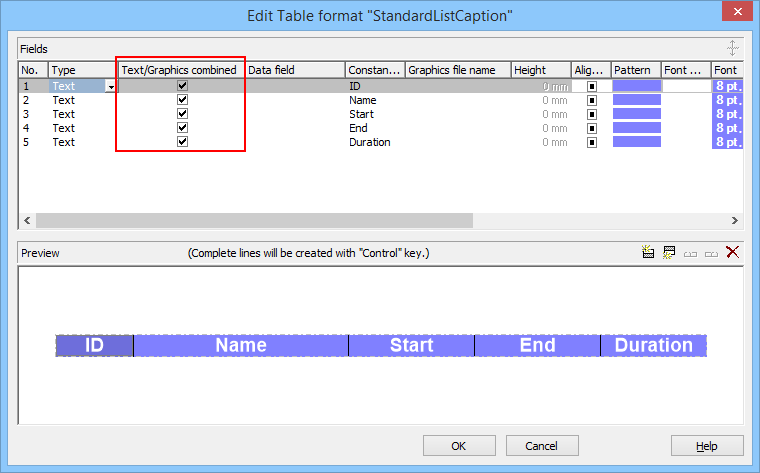 In the XGantt table format StandardListCaption you have to tick the checkbox Text/Graphics combined for all fields. //In the following 2 lines the namespace has be be adjusted as necessary. //Clicked again on the same column: Just reverse the sort order! Now try by yourself. If you do not use VARCHART XGantt so far, feel free to download a trial version. This version comes with full functionality, and we are happy to provide you with free tech support during your 30-days trial period. Want to get more detailed information on selected VARCHART XGantt features? Read our blogpost on how to customize the display of the duration in the tooltip.